After lunch, Mom and Libby kissed me good-bye for kindergarten. I walked down the front porch steps in my dress, anklets, and saddle shoes. Fresh from Appalachia, I had endured my first winter in Detroit when this warm, blue sky filled with birdsong and leafy branches blew in. All the more, I missed our green apple trees back home in Kentucky—my faithful hiding place. I dreaded passing Seven Mile Road’s noisy traffic on my walk to school. When my teacher first opened the windows to springtime, those three hours at my desk seemed an eternity. My classroom couldn’t supply what my soul needed most that June day. Of course I was too young to see the plain truth. My parents, teacher, and principal didn’t see it either. No, Mom was a grownup and couldn’t see I was a misfit. She was preoccupied settling into a new neighborhood with Dad and my two sisters and me. I was in the middle. 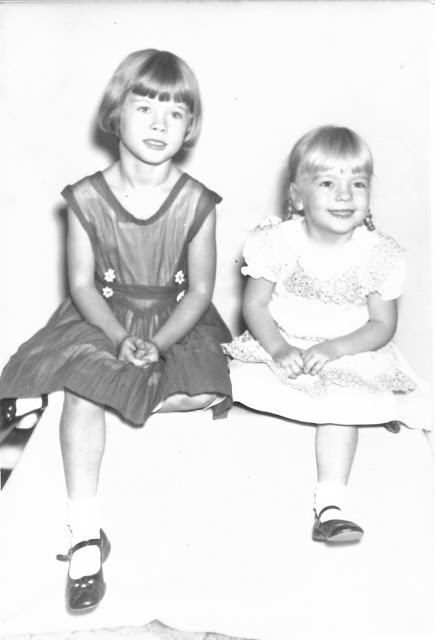 My older sister Linda went to the special Open Window classroom all day because she had asthma. She and her fellow students took naps in reclining wooden chairs. I preferred recess to naps. In broad daylight, there wasn’t one person outside on Yacama Street, on their porch or in their yard. Even the young lady kitty-corner from our house didn’t sit on her front porch steps with a mug in one hand and cigarette in the other. I had asked Mom why our neighbor wore her robe in the middle of the day. My older cousin Jan moved from Kentucky to work the night shift for Michigan Bell Telephone Company as an operator. Perhaps that’s where the neighbor lady worked. I stopped on the sidewalk and turned back, homesick for who and what I knew, loved, and left in the McCoy Bottom—for who and what knew and loved me. I longed to hug Old Shep’s neck, and run the dirt path past the old red barn to watch Uncle Hermie’s chickens peck and scratch. The desire for familiar adventure led me to the tall, wide tree in front of our house. I sat with my back to the rough bark and faced the street to hide from Mom. When Linda returned from school, we’d walk up the steps together. My plan might’ve worked if I hadn’t dozed off and awoke with bird doo-doo splattered on my head. I hadn’t considered that consequence. Mom gasped at my unexpected appearance. With pursed lips, she placed my head under the bathtub spigot and scrubbed my hair and scalp with aggressive retribution. “Don’t ever come back home from school again unless you’re sick,” she ordered. The one who knew and loved me most hovered over me, determined I at last learn my lesson. I did, dear Reader. I learned homesickness was not an excused absence, so I took to earaches. That’s the plain truth.